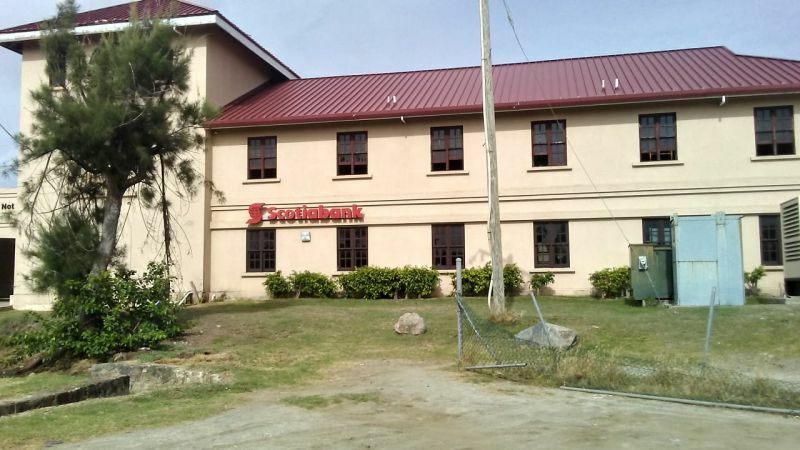 You are here: Virgin Islands News Online » News » Scotiabank in VG to close; no more banking services left! Scotiabank in VG to close; no more banking services left! VALLEY, Virgin Gorda, VI - Word reaching our newsroom is that Scotiabank on Virgin Gorda, will closed by the end of August 2018. It is unclear at this time why the bank would be closing the branch, leaving Virgin Gorda with no banking services. It means too, there will be no banking services on any of the other sister islands. Firstbank was, for a short while, on Anegada but that has since also shut their doors. Many see this as another blow, in the treatment of the sister islands and the lack of representation. No officials from the bank could have been reached before publication time. I wonder who or what will be blamed for this one. The Virgin Islands are going backwards instead of forward. Can you see more crime increasing? Who cares about the sister islands? NO representation. I heard the reason for this closure is increase in rent by the Investment Club. Then again the Investment Club is the Government. Poor WE. No worries, with election around the corner WE will show them who rule. "I heard" -- why not get the full story before posting? We thrive on rumour and innuendo. Didnt we have this conversation before?? ?and was told this infornmation is false??Hon.Walwyn! Is ScotiaBank on VG a tenant or a landowner? If it's landowner then that is not a good sign. If it is a tenant then there is more to this news story. Tenant. And you have hit the nail on the head there.... Land is owned by the same group as the marina. Rent went up. Bank went out. Online banking is there. We need to try it and stop being so absent minded. You can do your banking online from any part of the world. Including making cash deposit and withdrawals? Foolish you. Not everything you can do through online banking. When persons need cash at hand I guess we’ll enter our pin number in the phone and the cash will flow from the back. Sometimes you’ll need to see a bank representative for important things. Think about our aging population. They might not be familiar with devices or have someone around to assist with such. How about you stop being closed minded and be more open minded. Never did like any of those two banks. Banco, National Bank of the VI, where are you guys? This is a perfect opportunity. They too will also close down. Overheads are more than profits. The people ask for the banks and still go to town to do their transaction because they don't want people in their business. Small minds. VG with a population of approx 4000 is the second most populous island in the VI/BVI chain. Banking services are important to VG residents. Banks provide a place to safely keep savings(keeping money in the mattress is unsafe and unhealthy), pay interest on customers deposits, provide check cash setting services, offer loan to individuals and businesses. For example, business loans invest in and grow businesses, contributing to economic growth. The question is why is the bank/branch closing? Is the bank closing because it is not a profitable operation? Is it because its expenses, ie, property rental is increasing? So what are VI residents to do now? True, online banking is available but not all customers are into online banking. Many want a face to face interactions with staff. Will VI residents who want banking services now have to travel to Tortola for banking services, having to take off work, pay transportation among other inconveniences? What is government doing to help the sister islands with banking services? The D-9 rep and the four at large reps must weigh in on this issue or they only come around making promises around election time. Well, VG people are waiting patiently; we are wetting we hands waiting for ah yu. The Bank of the Virgin Islands belongs to the people so it shoulld be looking at delivering services to the sister island. Banco Popular too should at delivering banking services. Absurd and insane. Where are tourists supposed to re-charge their cash? Many local businesses are cash only. What are they supposed to do with their cash earnings. Keeping it under the mattress so to speak will only tempt thievery. Then the issue of not showing up at the bank with more than $ 10K at a time. Other businesses (e.g. contractors) may no longer accept cheques because they have to go to Tortola to deposit them. That said, building they are in belongs to BVI Investors Club, just like the marina, and look what happened there when they jacked up the rent. Why did First Caribbean move? Now I truly understand why my late grandparents had their money buried in a steel pan under the house. They use to say no bank is going to have control over their money. The establishments now need to put those small ATM machines there in a few stores, how do they expect people to get the much needed cash? I dont suppose evryone on VG banks with Scotia, so they must already be used to online or travelling to Tortola. Hasnt Scotia only been there since that building was put up? In the 70s I remember the Barclays manager traveling over in their own boat with a sack full of money to do business. constitutional rights - I hope the US deals with Scotia here and in Toronto. Good evening. A bank is like any business.It will make it's own decisions based on profit. If the VG economy can not support it's expenses it will need to close. You sound as though you think vip will be your savior and miraculously things will change. Politicians are all the same......just watch and see. Same old same old, but something better change for the better or we are screwed. Most of government systems and private businesses are too centralize. Bvi see remarkable growth over the last 10 years and no improvement of services esp to handle the increase population. West end is a very populated place with lots of bussiness, yet there is no atm machine from any of the banks. Sometimes we need to travel out to others caribbean countries and see how structured things are in terms of providing essential services. I will not say that Hon. Walyn is a liar, however, I do not believe him. Nonoe of theem coming clean and tell the people something of substancs. Listen! Me must come town to bank? Me?? ?